I can clear out a crowded fountain area just by “arriving”. My wobble and service dog can put people off. I’m big on time alone. I guess I’ve always been a bit of a homebody. Don’t get me wrong. I love interacting with people. However, if I go to much time without some “alone time”, I’m a grouch. I can tell I’ve reached my limit when I don’t filter what I’m saying and just “tell it like it is”. I’ve always wondered if it is an unconscious desire to drive people away by just being mean and ornery because I want – I NEED – to spend some time alone? It is a little “red flag” for me. If I get grouchy, I examine my schedule to see if I’m spending enough time alone. The time is necessary for me to re-group. Perhaps it is because I have a hearing loss and it requires so much attention just to listen. I may need to repeat all or part of what I heard in order to seek clarification. I can’t listen without thinking about listening. Gone are the days I can prepare food in the kitchen or wash dishes while talking. I have to stop what I’m doing and actively engage in conversation to communicate. I have to see well to hear well. I have to stop what I’m doing and concentrate just to hear. My husband has been accompanying Chloe and I for our evening walks lately. I’ve discovered that it is even difficult to WALK and talk at the same time. If I’m to communicate while walking, I don’t look to see where I’m stepping. It doesn’t take much for me to stumble. But who can watch the path if you are having to look at the talking head? Needing alone time means that I prioritize “me time” just to give my mind a break. I don’t even have to “turn my ears off”. But just being able to “be” without having to give something – or someone my undivided attention is very necessary to my coping. People with disability or invisible illness are sometimes alone by choice. It is easier to be alone than it is to deal with others. Maybe the stares bother us. Maybe we are tired of having to tell the same ol’ story about why we move funny, have a service dog, or overuse the word “Huh?“. Maybe it is just HARD to get out and about. Physical barriers can prevent some people with mobility impairment from creating social networks, creating a feeling of isolation and a lack of access to support (Matt & Butterfield, 2006). It may be HARD to go shopping or run errands. It may require a plan of action not needed by others. Spur-of-the-moment activities may be a thing of the past for people who are “differently-abled”. Maybe the person has felt shunned or as if they are “too much work”. I know that I have made the choice to not participate in something if I know I can’t be independent. It has kept me isolated at times. Chloe, service dog extraordinaire, can do so much for me. But she can’t disintegrate background noise so that I can hear better, nor can she eliminate a spin in my visual field. I’m incapable of visiting, for example, a food court in a mall without assistance. I cannot order, carry a tray, and walk to a table by myself. I’ve even clipped Chloe to my belt loop before with faith she would heel on command, and would find that I still have trouble balancing a tray with food and drink. I can’t balance it all and also look up to find an empty table. Balancing myself and avoiding falls is hard enough without trying to balance “stuff”! This has caused me to feel like I’m not as connected to some of the people I know who go and hang out at the mall or go to a coffee shop together. Sometimes people who are differently-abled are isolated because they ARE different. It is a common problem with human beings. If someone is different we may have stereotypes about what we perceive is different about them and then treat them in a unique way as a result. Sometimes people ignore folks with disabilities or chronic illness because they don’t know what to do or say. A colleague at work once told me, “Denise I’ve seen you wobble before just standing and waiting for an elevator. I was fearful that if I stopped and talked to you and accidentally bumped you that you’d go down for the count!” She had to learn through numerous interactions with me that I rarely fall as the result of another. I fall flat on my face under my own steam thank you very much. This same colleague told me that I “looked vulnerable”. Having a disability can scare people into keeping a distance – fearing what they don’t understand and choosing not to interact to cope with that fear. People with disabilities can sometimes advocate in a very negative, belligerent way. After doing so, they only succeed in setting the stage for that person when they encounter the NEXT person with disability that comes into their store or restaurant. I can always tell when a manager has had “difficult encounters” when they come up apologizing all over themselves to ask if Chloe is a service dog or if they can assist with anything. 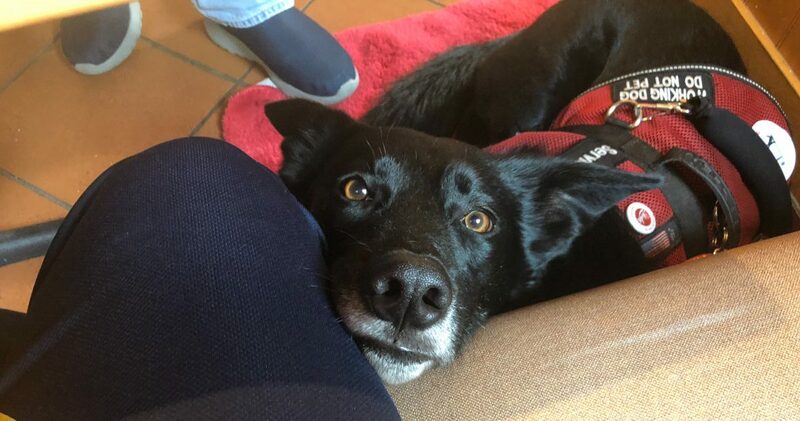 They have had to “battle it out” with angry people before to simply inquire if the dog they have brought into their establishment is a service dog. One day last month when I went out to eat I was given one of those electronic alert boxes to alert me as to when a table was available. The hostess kept apologizing and asking if she needed to come and get me, or would I be able to tell if the box was vibrating. Since it lit up and shook, I explained I didn’t need to hear anything. I would know when a seat was available. After being helpful to the point of almost becoming a nuisance, she said, “You are so nice. Usually when I ask if I can help someone who needs extra help they become angry and loud“. I blinked a couple of times. It helps me process. I responded, “Oh I’m loud, but I can tell you want to help. Maybe you should wait to see if the person asks for extra assistance“. Her eyes lit up and she acted as if that was the most novel, innovative idea. “Well why didn’t I think of that?” she gushed. Why indeed? The administrator at one of the schools I teach at told me, “Denise? I never know if you want or need my help with something. So I’m going to trust that if you need help you will ask!” I’ve always appreciated that. I know my limits. I’ll ask if I need help. Yet many don’t know what – if anything – to do to help. So they hang back and inadvertently ignore a person who is “differently-abled”. Regardless of abilities, most people just want to fit in and belong. They need connection. Without it a person can become depressed or anxious – even paranoid. Pretty, Andrews, and Collet (1994) explain that two important aspects of connectivity: a sense of community and social support have both been found to buffer against the effects of stress, anxiety and depression and to enhance well-being. People don’t realize that by forcing isolation on someone they can cause emotional injury. There is a difference between choosing quiet time alone, and enduring the painful reality of being alone in a crowded room. So what’s a person to do? Include them. Treat them like you would anyone else. Trust they will ask for assistance if needed. Treat them with respect – just like you should every person. Love them. There may be a few things they do differently, but their need for inclusion and connection is the same as your own. Work at really seeing every soul in a crowd. No one should be invisible. Matt, S. B., & Butterfield, P. (2006). Changing the disability climate: Promoting tolerance in the workplace.American Association of Occupational Health Nurse, 54, 129–134. Pretty, G. M. H., Andrews, L., & Collet, C. (1994). Exploring adolescents’sense of community and its relationship to loneliness.Journal of Community Psychology, 22, 346–358. I have met so many special people in my life. One of those special people is someone who has become one of my closest friends. 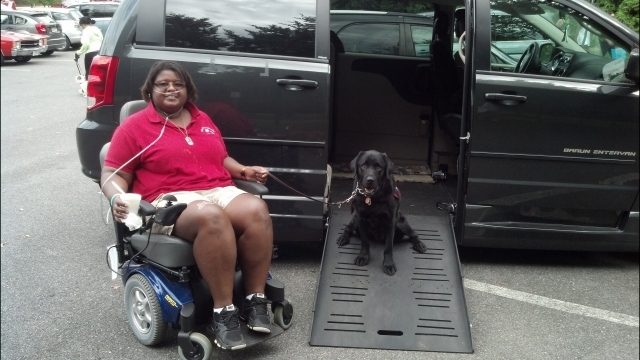 Cara is a fellow client at Fidos For Freedom, Inc., where I trained and received my own assistance dog, Chloe. I rarely promote fundraisers on here so I hope you understand that when I do choose to share a story it is because it is for a very unique and special reason. 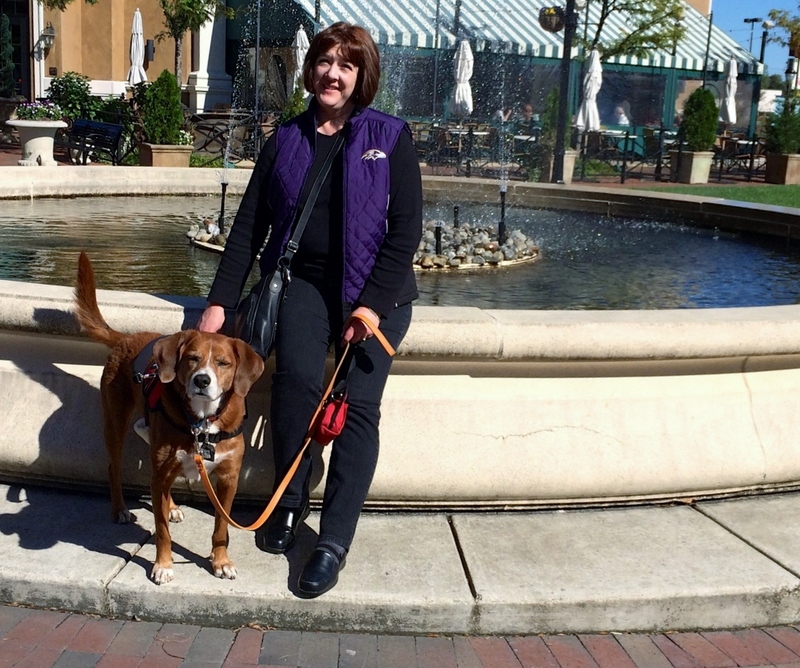 Cara first joined the Fidos For Freedom, Inc., family to train and be matched with a service dog to mitigate a chronic illness – Multiple Sclerosis. Since that match with her beloved, Tank, she has also been diagnosed with additional life-threatening illnesses. Cara doesn’t let “life” get in her way. She continues to volunteer for Special Olympics as her son enjoyed the activities. Justin (her son) passed away a couple of years ago, but she continues to stay active giving of her time and energy to this wonderful organization. Cara also often provides leadership in various roles at Fidos For Freedom, Inc., and encourages new clients as well as “veterans” like myself. Cara’s current transportation is “beyond any mechanic’s ability to fix” and she is fast coming to the point where she will no longer be able to attend Special Olympics activities, or Fidos For Freedom activities and trainings. Cara is trying to raise money for the conversion of a used van to make it accessible for her use. Please read her story below and click on the links provided to read an in-depth biography of this incredible lady – as well as information about why she is raising money. Imagine not being able to go out and hop in a car, call a taxi, etc., because you do not have transportation that can carry you, your wheelchair, service dog, and oxygen tanks. You become house bound and lose the ability to be involved with others and with life. Help us not let this happen to my friend, Cara. This is not a scam. Would you consider donating even a small amount? More importantly, will you share this post with others and encourage them to donate small amounts as well? In a short time, people networking with other people, folks who CARE about others and reach out to help, will help Cara meet her goal to have reliable transportation so that she may continue the quality of life she enjoys. I hope you will consider helping – and sharing! Today I’m launching a fundraiser at http://tinyurl.com/AVanForCaraAndHerTanks. I usually don’t like asking for help, but find myself in the humbling position of needing to do that. Due to my failing health, I am using my wheelchair a lot more often lately. The lift in my van is labor intensive and is becoming more difficult for me to use. In addition, my van is old and I’m concerned about it’s safety on the road. I drive myself to the hospital and to several specialists, almost once a week. I am asking for your help in raising the funds I need to modify a used van with an automatic ramp, lower the floor, put in a kneeling system, etc. This will allow me to transfer to my chair safely from inside the van. I’ll be out of the elements, away from strangers, and out of the way of traffic. Please visit my fundraising page at http://tinyurl.com/AVanForCaraAndHerTanks where I share my story and to find out how you can help. If you would also share this with your friends and family, it would help me greatly! Hearing Elmo welcomes Dr. Terry D. Portis as a guest author this week. Terry has worked with the disability community since 1990 with The Brain Injury Association of NC, and then the Hearing Loss Association of America. 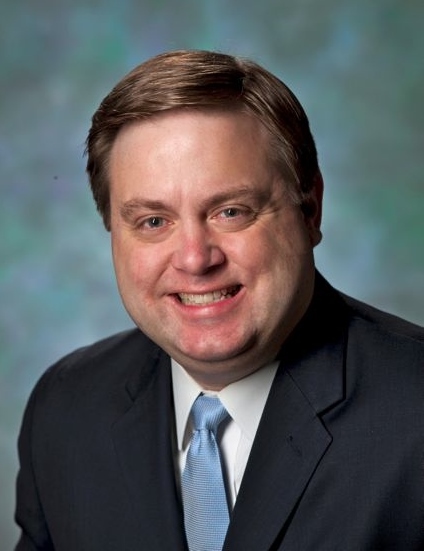 He now works as the director of the Center on Aging and LifeStages at AACC. He supervises more than 220 faculty who teach more than 1,600 course sections each year, making it the largest program of its kind in the country. In the September 21, 2013, edition of the New York Times, Katherine Bouton wrote an excellent article on the quandary of hidden disabilities. In the article she talked a lot about workplace issues, and whether or not a person should reveal their hidden disability. It is an excellent article, and I recommend it. While the Bouton article focuses on the workplace, or potential workplace, what about issues with hidden disabilities with family and friends? Here are three things that happen in relationships where a disability is a factor. I’m used to it, and don’t think about it anymore. As family members and friends, we might want to remind ourselves the challenge that the person faces living on a daily basis with a disability or chronic illness. It might have taken all the courage they could muster just to go to work today. For the person with disability, don’t let this forgetfulness hurt your feelings! How could they forget? Well, you want them to forget. You want people to see you for you, not you, the disability. Good days, bad days… how bad is it? With many disabilities, the person will have good days and bad days (like all of us). Numerous factors such as the weather, fatigue, stress, or even diet can have a significant impact. If those issues are managed or under control, then the person’s disability might not manifest itself as prominently. Change one of those factors, and the person might struggle with tasks today that they seemed to handle quite well yesterday. A personal example would be that two days ago my wife, who lives with a balance disorder, could walk across the room without any difficulty. A major weather system is now coming into our area which means that yesterday I had to grab her elbow to correct her balance a number of times just to talk to her. For the friends and family members, don’t let this uneven performance cause you to doubt that the person is struggling as much as they really are. They aren’t “faking” on the bad days, even though to the casual observer it may appear that way. For the person with the disability, celebrate the good days, and don’t let the bad days cause too much frustration. Realize that the people around you don’t intuitively know whether you are having a good day, a bad day, or something in between. People also do not have your level of understanding of what having a good day or bad day means. They work and live with you; however, you live with the disability. With advances in prescription medicines and medical technologies, people often find some relief or remediation for their disability. New hearing technology? Well, glad you can hear now. New medicine for your seizure disorder? Glad that’s over. The truth is, it is not quite that miraculous. For both friends, family members, and the person with the disability, realize that new medicines and technologies will probably not take away all the challenges created by the hidden disability. In many ways, they are miraculous, and we should be thankful for the day and time in which we live. On the other hand, let’s not allow unrealistic expectations dampen our enthusiasm for the better life that people with disabilities can lead. 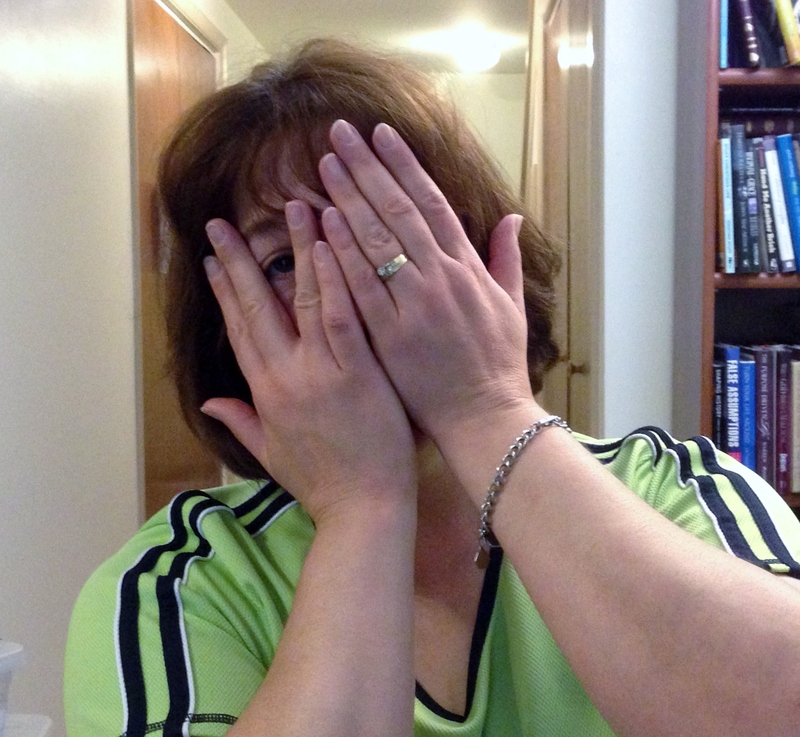 Hidden disabilities create challenges in a person’s life, and in their relationships. Relationships are always “messy,” and often unpredictable. Taking a few minutes to remind ourselves of other people’s perspectives strengthens those relationships. In turn, our lives are enriched and we find deeper meaning in everyday life and work. If you would like to contact Dr. Portis you may contact him at Lightkeeper’s Journal.